Federico Fellini is one of Italy’s greatest and most influential filmmaker with a style and substance rarely matched in European art house film, especially in earlier work. A number of his pictures have recently made it into the Sight & Sound top 100 poll with his masterpiece 8 ½ even finishing within the top 10. He’s a director who often portrays the struggles of humanity in the name of creativity and art, but also ties them in with themes of relationship breakdown and escapism from hectic worlds. 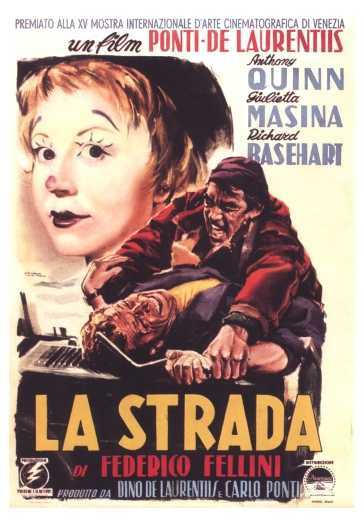 La Strada (1954) may not be his most well regarded film but it’s easily his most subtle and affecting. Drawing from his own experiences in vaudeville, like so many other films of his, he transplants a story of an escape from circumstance into this travelling sideshow world making it seem genuine and fitting. Fellini’s wife Giulietta Masina plays a timid and adorably polite gypsy girl who’s given to a travelling strong man to use in his show. Though the family are sad to see her go, it’s clear that this is a form of escape for Masina’s character. She seems in awe of all of her surroundings outside of her little world by the sea and is seen as weird by the people in the real world. The whole of La Strada is held together, not by Fellini’s masterful direction but by Masina’s performance. She’s a heartbreaking character to watch and as the film progresses, the urge to pick her up out of the screen and give her a hug seems overwhelming. A doting but obedient helper to the strongman, she gradually watches the relationship turn from mildly cool to aggressive. Zampano the strong man is never truly nice to her yet he is the one left broken and alone by the films saddening finale. Though the film is the ultimate in tragedy, easily up there with the like of the classical forms of the drama, La Strada is littered with joyful moments too, again all thanks to Masina. As she impresses herself with her own performance skills, she can’t suppress a smile and a modest look downwards. She’s so effortlessly loveable and probably one of the nicest characters in cinema. Fellini isn’t just out to make the viewers emphasise with the travelling performers, he’s setting them up for powerful and emotionally charged tragedy at the hands of Zampano. Having been made a fool of by another performer (who also flirts with Gelsomina suggesting that his love is a tough but hidden and even misguided one) upon running into him again, he kills him much to the upset of Gelsomina who’s distraught and scarred by what’s happened. From here on Gelsomina shuts down, now escaping from her original escapism the only way that she can: by ignoring the world around her and focusing constantly on the murder. Becoming angry with her refusal to eat or say anything of sense, Zampano leaves her to the elements in search of drink and work with guilt eating away at him. The final torture comes from the future development that leaving Gelsomina has caused her death which is never shown but sadly related like an old folk tale. La Strada isn’t a showy piece of film. There’s none of the trickery involved that epitomises Fellini’s later work and the glamour of that work is also curious by its absence. Instead we have a film entirely focussed on it characters and the effect of the narrative on their complex and demanding relationship. The demands on the artistic are transposed to later films like 8 ½ and Le Dolce Vita but La Strada is easily the most subtle take on the crippling nature of creativity and is the most emotionally resonant in Fellini’s back catalogue.